ecco, un paio di stivaletti mi servono proprio! Anche io credo che gli ankle boots siano un capo chiave, perfetti per tantissimi look e soprattutto per queste giornate ancora incerte, tra l'altro questi di Bershka sono stupendi! Non sono il mio tipo di scarpe ideali ma quelle nere non sono male! Sono decisamente comodi e stilosi, perfetti per la primavera!!! I love boots so much I just want to wear them all the time all year round! These ankle bookties are just perfect for the warmer seasons with bare legs and nice girly dresses. I'm pretty sure you will rock them perfectly! sporty monday - I think the outfit is super comfortable and casual but still evry polished and stylish for a weekend stroll. The checked top is very nice, and ypu look great, indoors or outdoors! Great and super inspirational choice of copy for less outfit post! I really fancy this combo! I fell in love with ther whole look and you've made it an amazing reproduction job! I must say that I'm amazed and at awe with the look of white and red wine, babe! This combo is elegant, stylish very charming for sure! . Loved the coat and wine red skirt and that statement necklace looks stunning! Those accessories are just lovely and your make up to die for! you're such a stunner!! wish you a lovely rest of the week dear. Essential tips. I love ankle boots. Morning Lilli! Believe it or not, I only have one pair of ankle boots and it's sky high with very slim heels! I have no idea what was I thinking when I bought it so I rarely wear it before and never wear it at all now. It's just impossible to wear something that high and slim heels while carrying my baby. LOL! secondo me sono comodi e trendy! Adoro la loro versatilità! Mi piacciono molto entrambe le versioni! Cara Lilli questi stivaletti sono assolutamente perfetti in questo periodo! L'inverno è finito ma in realtà non lascia ancora spazio alla primavera!! Oggi poi qui a Roma sembra novembre!! ...adoro questi stivaletti...si abbinano con tutto e sono comodi!!! lilli sto cercando un paio di stivaletti. Non so bene quali scegliere e questi sono una valida ipotesi. Oggi ho fatto un mini giro ma non ho trovato nulla. I like angel boots and those look gorgeous! I have a pair in black color!I have to bye in brown colot too! Thank you for sharing! !Have a lovely evening!Hugs! Sono molto belli! Baci tesoro. I still need a pair of these and I have been on the hunt for the perfect pair for ages now! Thanks for sharing hun! I love them in both colors! Kisses and enjoy your day hun! Anche io adoro questo tipo di stivaletti, ne ho almeno 5 paia in colori e materiali diversi! I love ankle boots! They can be so chic and I love that you picked a few versions with a nice chunky heel! I do think think they can be worn all year too! Great advice on picking a good pair! Mi piacciono questi stivaletti e poi sembrano comodi! Ankle boots are my favorite footwear during the transitional seasons too! They're good to bridge the weather as it's still cold and can also sometimes be wet plus there are so many stylish options out there. I really like your picks Lilli. They look very chic and versatile! I don't have a pair like these but they look great. I like the black version best! How are you? Hope you're having a great week!!!! E' vero Lilli continua a piovere e non smette più! Oggi qui tempo grigissimo e vento, uffa! Gli stivaletti sono l'ideale per questo periodo, poi così sono proprio carini! Dear Lilli, I really like Booties and own some pairs. But i think these kind of shoes are not easy to wear. Sure, together with Leggings or a skinny denim they looks great. But in combination with a dress or skirt, theses shoes, shorten the legs. But sometimes that doesn´t matter. Booties are to cool. 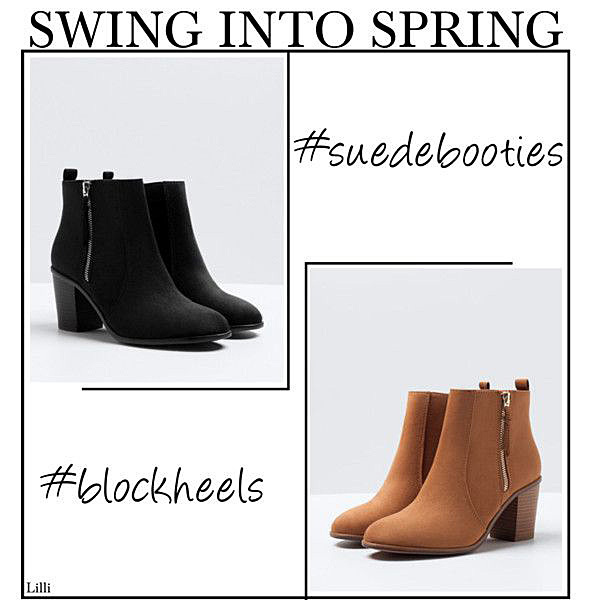 :) Black and beige are great colors for booties, love your selection. Both of those styles are really cute Lilli! You can wear them with pants or skirts. Basic colors too! I wish I could send you some of the warm weather we are having. Hi Lilli, anything suede is in style now. Those ankle suede boots are perfect during this spring time. I usually wear them with blacks socks or tights. I agree, I can't wait for the rain to stop. But the soil needs the rain and for the flowers to grown back. Hi Lilli! I totally agree with you.. ankle boots are always so versatile especially during season transition.. it's not too hot and it's not too cold. Also, I love how many outfits you can wear to match them.. they're so easy to wear and looks very chic! I actually prefer them rather than winter boots, still works great for me during autumn and winter :) Hope you have a lovely day Lilli! This is such a beautiful purchase my doll! Ciao Lilli. Qui non smette più di piovere e gli stivaletti sono l'unica cosa che posso indossare in questi giorni. A me piacciono e trovo molto carini anche quelli che hai scelto tu. The weather has been the same here too. I still wear my winter clothes and shoes. Hi Lilli, you made me remember that last winter was looking for some boots beige similar to your samples and could not find hope to have better luck this winter!